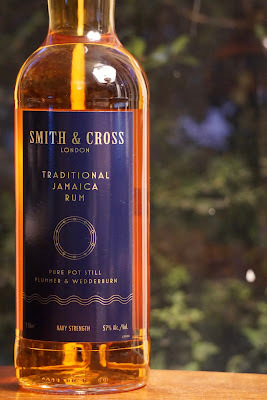 Smith & Cross Navy Strength (57.0%): First post of the whisky-alternative January... It is a classical Jamaican rum from Smith & Cross a London based sugar and spirits producer whose history goes back to 18th century. The rum in the bottle is blended with pot still rums distilled by Hampden Distillery using heavier and more robust style Wedderburn distillates which are aged less than a year and lighter bodied Plummer style distillates which are aged up to three years in ex-bourbon casks. It is bottled at 57.0% abv or 100° English proof which used to be the traditional British Royal Navy strength. Color: Light copper with thin but oily and very persistent legs around the glass. Nose: That's exactly what I was hoping for: Heavy, oily and pungent... Latex gloves, party balloons and overripe baby bananas. Orange jam, bergamot peels and quince paste. Molasses, wet tobacco, dried figs, burnt orange peel and nutmeg. Everything you would expect from a pot still Jamaican rum... Adding water instantly thins the texture on the nose. More rubber and latex less fruit and molasses. Palate: Thick, rubbery and dry. Prunes, more tobacco and old and worn out leather upholstery. Burnt rice pudding and creme brulee. Very hot at this abv... Adding a few drops of water opens it up quite nicely. Lit fresh rosemary sprigs, spruce and pine cones. Lemon peel, juniper and grilled pineapple rings. Green banana peppers and lemongrass. Finish: Goes forever with burnt matches, rosemary and over brewed earl grey tea notes.